Designed for low-volume, light-duty applications, the Ezi-MT is perfect for small businesses, schools, cafes, and offices. The economically priced Ezi-MT™ Manual Bin Tipper takes the strain out of emptying bins, making this task safe and easy. A unique lift-and-tip action keeps bin weight within the footprint for greater stability. A heavy-duty winch allows up to 143 pounds (65 kilograms) to be easily tipped without risk of strain or injury to staff. The lack of electrical and hydraulic parts means less service and upkeep costs. The Ezi-MT protects your staff at a minimal investment. Virtually anyone can easily maneuver the Ezi-MT with its four durable casters, making this Bin Tipper even more versatile. The Ezi-MT suits 32- to 96-gallon (120- to 360-Liter) bins with no adjustment. 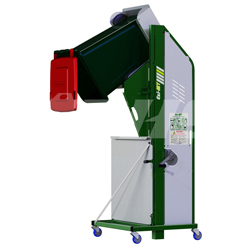 Contact our sales team at 1.800.BHS.9500 to learn more about the Ezi-MT and other bin-tipping products. To read more about this innovative and ergonomic equipment, download the PDF above. Bin tippers can be specified to meet international standards and/or CE regulations for an additional cost, depending on environment, application, and other factors. Bin tippers are available either partially or completely constructed from high-grade 304 stainless-steel, suitable for hygiene-critical or corrosive environments such as food production or chemical processing. Corrosion-resistant lifting chains and fittings are also available.